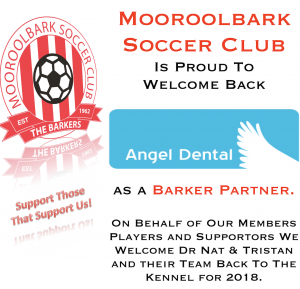 Mooroolbark Soccer Club is very proud to announce that Angel Dental has again agreed to be a Major Barker Partner of The Club. Dr Nat and her team have now been a Gold Barker Partner for a number of years and we thank them for all their support. We encourage all our Members, Players and Supporters to visit Angel Dental in Kilsyth and Rowville (soon to be Forest Hill Chase as well) and Support Those That Support Us. Recipient of the British Dental Association Gold Medal and other prizes at qualification in 2005, Dr Natalie worked in both private practice and the National Health Service in the UK. Whilst undertaking specialist qualifications with the Royal College of Surgeons (Ire) she worked as a Maxillo-Facial Senior House Officer, assessing and treating facial/dental traumas, head and and neck infections and cancers. Since arriving in Australia, Dr Natalie has provided private cosmetic and restorative dentistry in South Australia and Queensland, before settling in Mount Dandenong and establishing Angel Dental Kilsyth and their sister clinic in Rowville. When shes not enjoying a run, Dr Natalie enjoys spending time with her four children and husband, Tristan, who is also the business director. Once again we thank Angel Dental for all their support.